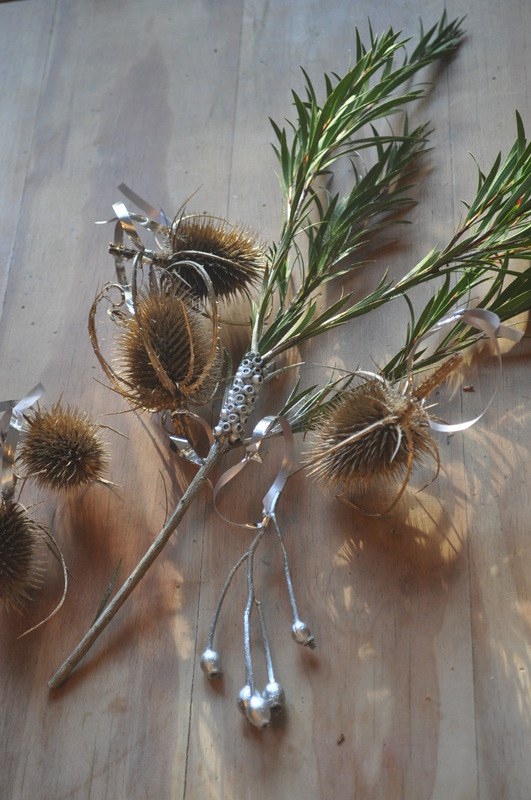 It was the posh shabby-chic Christmas catalogue that came through the post a few years back that provided an incentive for me to start making my own festive decorations from items gathered from the garden. I balked at what they were charging for what (appeared to me) to be simply bits of tree with silver spray-painted on them…. Willow is perfect for making a base as it’s so pliable and you can use garden twine to bind a couple of thin branches together. The evergreen foliage can then be easily tucked into place behind the wrapped around twine. 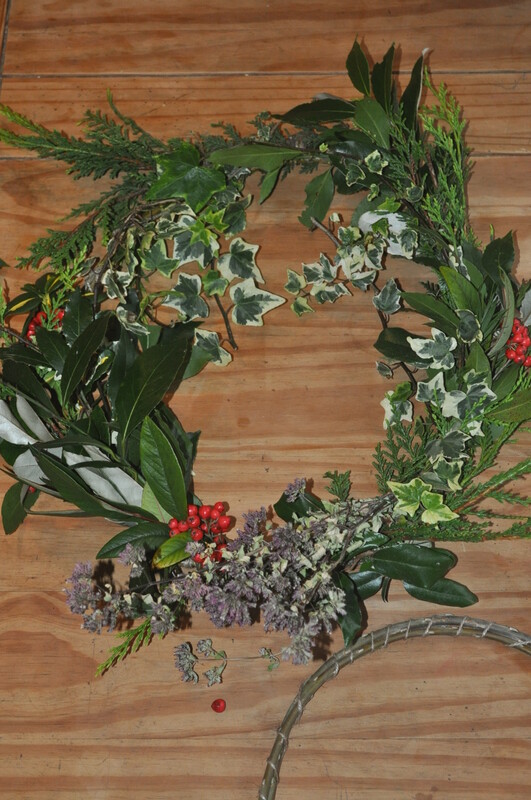 Choose from cypress, ivy, rowan berries, holly, bay and any other leaves you like the look of to create a simple yet effective display. 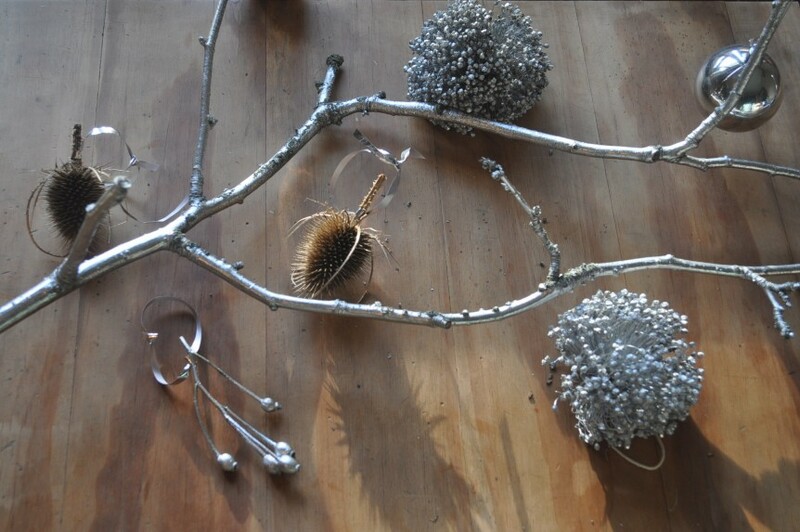 Just some basic branches, maybe adorned with a little silver spray can be used to hang your home made decorations from. Rose hips, leek flower heads, pine cones and thistles all make fantastic (and long lasting) baubles. Wash an old hessian potato storage sack then using stencils (and silver or gold spray) you can spray paint simple patterns onto it. A bit of tacky tinsel around the top and you’re good to go. I’m sure there are many more ideas for pain-free Christmas decoration making that I haven’t touched upon – I’d be really interested to hear your experiences and suggestions @badlybehavedone www.facebook.com/getbadlybehaved.